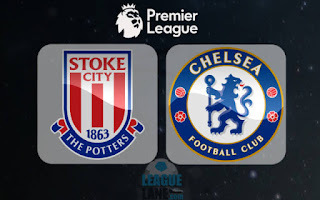 Stoke City will host the premier League leaders Chelsea at the Bet365 Stadium, who hope on increasing their lead on the premier League after their heroic Manchester United knock out of the FA Cup. Mark Hughes side fell 4-2 to Chelsea in their previous clash back in Stanford Bridge and ahead of this clash are in some good form though the Stoke Boss has a few injuries to worry about. Mame Biram Diouf is doubtful with a knee injury, while Xherdan Shaqiri and Glen Johnson are battling to regain fitness after thigh and shoulder injuries also Jack Butland has made positive progress in recovering from a fractured ankleStephen Ireland is still some weeks away from returning as he continues rehabilitation after a double leg-fracture. Chelsea on the other hand have had little injury problems to worry about this season, David Luiz manages a minor knee injury and has been very effective despite the team having big Clashes also for suspensions John Terry, is the only one after been sent off in the FA Cup against Peterborough United. Stoke gas been unbeaten in their last 8 Premier League home fixtures and have kept three clean sheets in their last four games and against Chelsea who have had just two clean sheets in their last nine outings.